It is May 14th in the evening, already 6pm, and we are back at Gorak Shep. 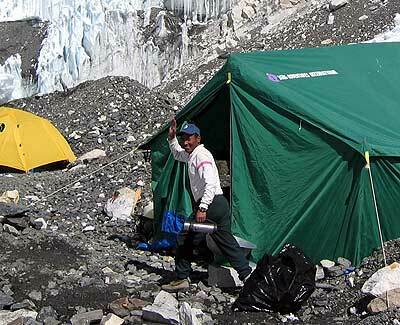 I told you that we would call you from Everest base camp, sorry that we did not. The entire team did make it all the way to Everest base camp today. Wes, Dan, Katherine, Richard, Mark, Brad, Shelley and myself and all the sherpas got there, believe it or not, at 10am, quite early today. Then it took us 45 minutes to walk from the bottom of base camp to the top. We had a lot of friends there of course, all the climbing Sherpas from over the years, many western friends that we met on this trip and before. 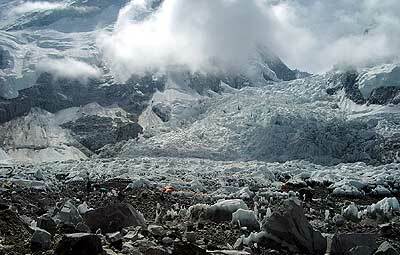 We had 5 invitations for tea at various tents before we got to the top and took our relaxing time right at the base of the Khumbu icefall; looking down on base camp and up into the Khumbu icefall. Then we began to descend back to base camp, stopping for some tea as we said we would do, it is always a bit stimulating and tiring being at Everest base camp; there is so much around. This year especially we were out of time; all the climbers are down as well as the Sherpas. Most people seem very confident, relaxed; in the next 2 weeks time, this group of people will be, at various times, attempting the summit. I have to say of all the many years that I have been coming to Everest base camp, as a climber and as a trekker; I don’t recall seeing a fitter and a more relaxed, and a nicer group of climbers all in all than we have seen this year. More people that I can even mention. Especially it was nice when Will Cross was standing now in front of his tent, with cookies on offer as we walked through, we promised to go back and see Will. And Apa was there of course, one of my old dearest Sherpa climbing friends. He will be climbing with Will in a few days time. Then we saw Da Sona, from the Berg Adventures Ama Dablam team last year. 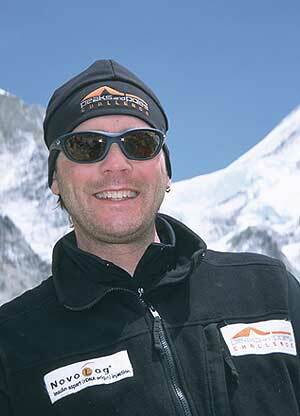 And a real special character showed up, it was Shom, you remember Berg Adventures Everest camp 2 cook from 2003. The list goes on and on, I can’t name them all. Shelley finally got to meet a lot of people she deals with, on phone calls and on the internet throughout the year, put faces with names, people that she already felt she knew from communicating. Now we are back down at Gorak Shep; had popcorn, soup and washing water brought by the sherpas. A tremendous sense of satisfaction and accomplishments in each member’s part. I can tell you friends and family back home that there are some very proud and satisfied people here. They are coming home to tell you that this trip, especially Everest Base camp, was far more than they could have expected. Hard to describe and not disappointing.